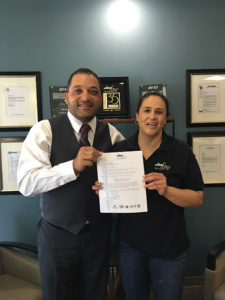 For Dallas based franchisees Dalia Revilla and Laura Najera growing their business comes down to just a few key strategies, but they are ones that are most important in any service industry. This month’s crown club winning team earned their recognition, and new business, by focusing on customer satisfaction and it’s paid off. The team purchased their franchise in 2009, after Revilla was referred to Jani-King of Dallas by an employee. She always wanted a business of her own to help others and Jani-King offered the right opportunity. Now, the franchise has 10 employees and plans to take on larger accounts in order to not only help their business grow but to help others success at work. Revilla and Najera say they are excited for their future with Jani-King and anticipate growing their business and developing additional staff through great customer service. “We are more than thrilled to see our business thrive and we will continue to maximize our potential,” concluded Revilla.